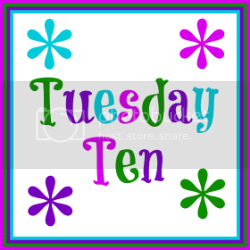 The Golden Spoons: Tuesday Ten - What's In My Car? This week, for Tuesday Ten, we are cleaning out our cars and sharing what we find! When we did this with our purses a few weeks ago, it was a big hit, so hopefully, everyone will have fun with this one, too! A couple weeks ago, I sent my husband to get the oil changed in our minivan. He came home with a new van! Long story short, our lease on the old one was almost up anyway. Our van still has the new car smell and is actually still pretty clean. so, to make it a little more interesting, I decided to vlog today's Tuesday Ten! Come link up again next Tuesday! April 15th is National Rubber Eraser day and we'll be sharing ten mistakes we've made and what we learned from them. It should be interesting! Now THAT'S not FAIR!!!! You got a NEW CAR!!! It's all clean and tidy and everything!!! Lucky girl, you planned that didn't you? Pff. Love it..... I am with you on the new car thing. After 11 years I said goodbye to my beloved minivan, I can't believe I am getting sentimental over this. Anyways the minivan didn't go to far, to the oldest in high school. I still see it every day! Love how clean yours' is too..... I was scared I wouldn't find ten things in mine! Originally I thought this post would be embarrassing because there would be so much trash, but turned out to be horde to find ten things. Your husband is full of surprises sometimes too! I wish mine would come home with a new van. He did come home with a puppy and also started painting our front door blue, so I guess maybe I shouldn't expect anything for awhile. I have one daughter (and me) and we have hair ties EVERYWHERE. So I imagine you have triple! Well, I think the puppy was a pretty awesome surprise, too! And, there are definitely hair accessories everywhere! We've got hair bands, too. ALWAYS hair bands! I'm pretty sure that there's (at least one) dried-out rogue French fry underneath the driver's seat that was dropped and long forgotten. actually your van looks great! I just got a new car too and the seats are covered in mud and there's always a toy airplane in the seat. I LOVED that you vlogged this!! Awesome. Also, cheddar bunnies. You do NOT want to see my car. It's a disaster. LOL Hoping to be back in the next week or two. Need to check the topics!